Once upon a time, there were two honest and hardworking artists called Susie and Sonia. 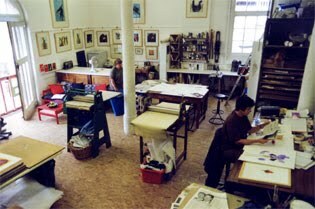 They toiled away in a very spacious printmaking studio called Half Moon in South London – and here is a picture as it was in the olden days. Of course, this was not the end of their story as we all know that principal characters never seem to learn anything from their various predicaments and carelessly carry on making the same mistakes over and over again. So, consequently a little shih tzu called Tommy and a huge standard poodle called Casper also felt compelled to daily undertake the long, arduous journey into this crowded studio from far-flung corners of South London. So, children, the moral of this story is that no building can expand outwards, however much important stuff (and printmakers and dogs) we feel we need to cram into them but it doesn’t matter – we keep trying anyway. The "olden days" looks wondeful, but presumably the rent comes down with more people to share it? It looks cosy now. 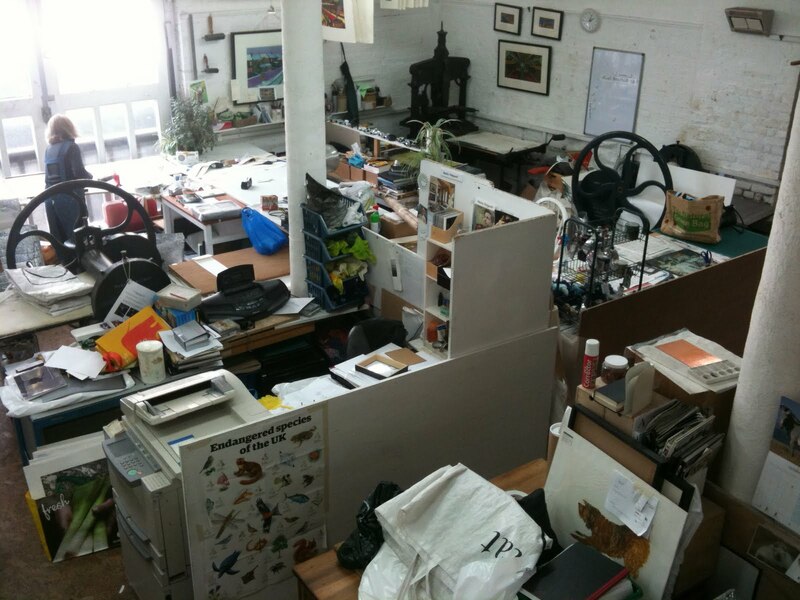 We do have a mezzanine floor – which is where the photos are taken from and which of course is full (of frames). Looking on the bright side, yes, the rent does come down – unfortunately the three dogs seem curiously reluctant to contribute….